As Chinese society becomes more open, and hopes rise that control by the Communist Party may become more relaxed, a great deal is expected from non-governmental organisations (NGOs) in the formation of civil society. 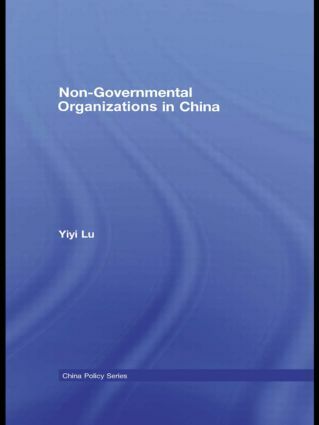 This book, based on extensive original research including detailed interview research in over 40 Chinese NGOs, discusses the current position of NGOs within China. It argues that although all NGOs – both those originating as a result of government initiatives, and those which are popularly-organised – are dependent on the state, all enjoy a very large degree of autonomy. This autonomy arises in part because of the limited capacity of central government to control NGOs, and in part because of the fragmented and non-monolithic nature of the state, which enables individual bureaucratic patrons to protect particular NGOs, especially officially-organised ones, from the full impact of state control. The book also discusses the skill base of NGOs, showing that this is somewhat limited, and argues that, contrary to current hopes that NGOs and thereby civil society may flourish, the lack of state control is already leading to an "uncivil society" where rules do not exist or are ignored, and where organisations which are supposed to work for the public interest are being used to serve illegitimate private interests instead.